On this website, you can browse the complete archive of images recorded by Pi Gazing cameras. You can look up what the sky looked like at any of our observing locations on any night. Or, you can browse all of the moving objects we've spotted. You can use our images to track all sorts of celestial phenomena. You can watch the constellations change with the seasons, track the changing phases of the Moon, or see the planets move across the sky. Our projects page has instructions to guide you through these, and many more activities. To begin with, though, let's look at some of the moving objects seen by Pi Gazing. We'll show you how to spot planes, shooting stars, and spacecraft like the International Space Station! An example image of a plane, as it might appear when you search Pi Gazing images. Click here to see a full video of the event. When you search for moving objects, you'll see a gallery of long-exposure photos of each object seen. Clicking on these will bring up a video clip of each object. The moving object usually appears as a bright streak across the image, because it will have moved across the image as the long exposure was being taken. A blue cursor will help you to spot the moving object. The cursor will gradually move back and forth along the object's path. Not all the videos contain real moving objects. Sometimes the cameras trigger because of stars twinkling, or video glitches. By far the most common objects you'll see are aircraft. They're usually obvious because their lights flash on and off. 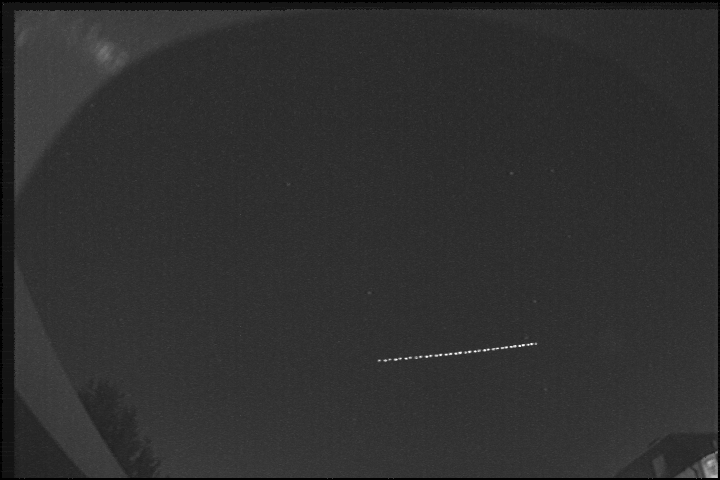 Because the lights flash as the aircraft moves across the picture, the long exposure photograph often shows a dotted streak. 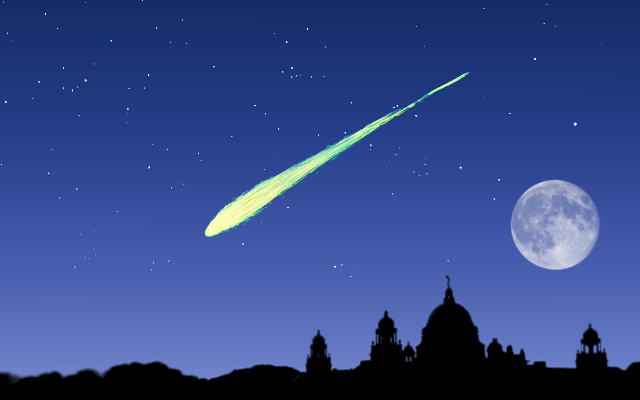 An example image of a meteor, as it might appear when you search Pi Gazing images. Click here to see a full video of the event. Shooting stars are distinctive, because they move much quicker than planes and satellites. They usually come and go within a fraction of a second, as they burn up in the Earth's atmosphere. 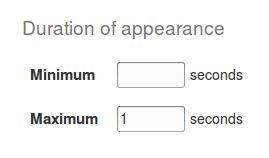 Within the search interface for finding moving objects, you can set limits on how long the object was visible was for. 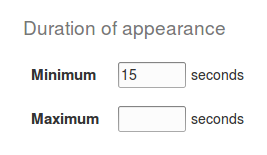 Try reducing the maximum duration to one second – you'll only see objects that were gone within a second of first appearing. Look for objects that moved a significant distance within that short space of time, and you're very likely to find a few shooting stars. Shooting stars are only visible in clear weather, as they burn up high in the atmosphere, far above the clouds. On clear starry nights, we often see two or three each night. 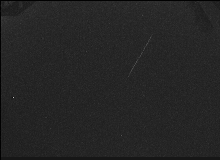 An example image of a satellite, as it might appear when you search Pi Gazing images. Click here to see a full video of the event. 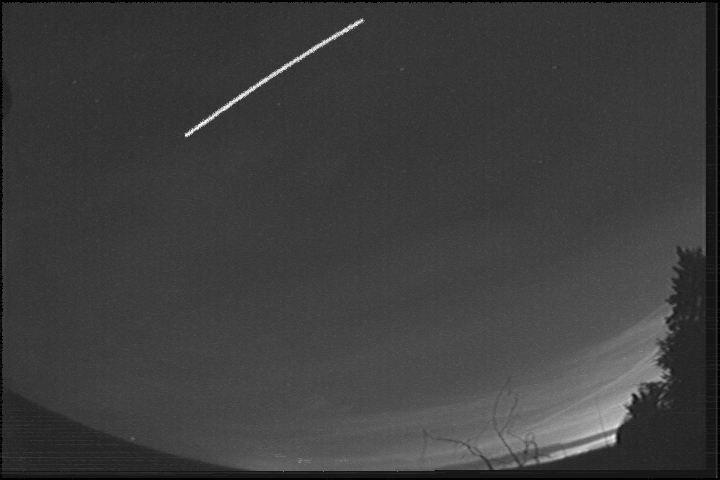 Satellites are often visible soon after sunset, and shortly before sunrise. A few of the brightest, such as the International Space Station and Chinese Tiangong space station can appear even brighter than the brightest star. Like planes, they are visible for much longer than meteors. They usually take a minute or more to cross the sky. They move at a steady speed, and unlike planes, don't have flashing lights. 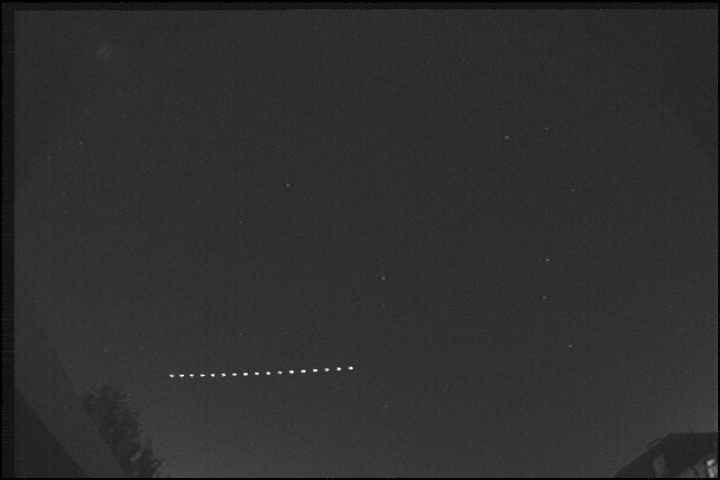 The flight paths of satellites are extremely predictable, and websites like In-The-Sky.org list the times when bright satellites are due to fly over. Not all of these will be seen by Pi Gazing, since our cameras can only see half the sky, and satellites are only visible in clear conditions. 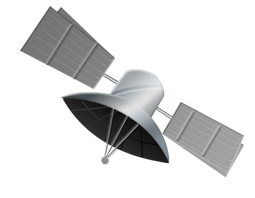 To search for videos of satellites, try restricting your search to objects that were visible for ten seconds or more. You can do this using the same duration control that you used to search for short-lasting shooting stars. Most of the objects you'll see are planes, with flashing lights, but a few may appear with a steady brightness. These are likely to be satellites. To be sure, try checking against the predictions on In-The-Sky.org. Some satellites, however, aren't listed on the web. These include spy satellites that don't officially exist! To start searching for images taken by Pi Gazing, our online search interface is the easiest place to start. Once you've started looking through our images, our projects page will give you some ideas for other things to look our for in the night sky.